We can say that to be Not Free would mean to be under the power of something other than yourself. To have something or someone controlling you. I heard a pastor say that Freedom is not necessarily the ability to do what ever we want, but rather to desire to do what is right and the ability to do so. I believe there is a lot of truth in that. When I think about my freedom now, it is apparent in comparison to my old life. A few years ago, I was under the control of food. I scheduled my day around food. I thought about food, ALL THE TIME. My emotions were lead by and soothed by food. I ran to food, I followed food, I loved food. And it had a mighty grip on me. Although you might say I did all of these things out of my own will, I was unable to stop. I was addicted. Its funny how so many addicts make the statement that they can “quit when ever they want to.” But the problem with addiction is that no matter how hard you want to, its nearly impossible to quit without assistance. Although I ate WHATEVER I WANTED!!! I by no means was free. I was trapped. Trapped under the weight of food, how it controlled my emotions, my body, my health. I thank God that I found help. That I got out. I became freed! Now I am FREE. I am in control of food, food is no longer in control of me. It is utterly amazing the freedom that comes when you leave an addiction behind. I feel much more free now, even though I don’t eat everything under the sun. I am so much freer now that I do not run my emotions on how food makes me feel. I am so much more free and in CONTROL of my life. Instead of desiring what ever the heck I want, what I want is what is right for me. I have a freedom of mind, and a peace beyond words. If I had to give up something that once felt like a freedom to gain this new freedom, it was well worth the loss. And what a blessing it has been to help others find this freedom. I am so delighted to hear story after story of my clients and friends who are radically changing their lives, taking control and gaining freedom! Heat oil in a soup pot over medium-high heat. Sauté celery and squash until soft and browned. Add chicken stalk, coconut milk and curry. Keep at a soft boil. Using a mallet or by smashing against the edge of your counter, smash the lemon grass stalk (be sure to keep it in one big stalk so its easy to remove.) Remove the outside peel and add to the soup. 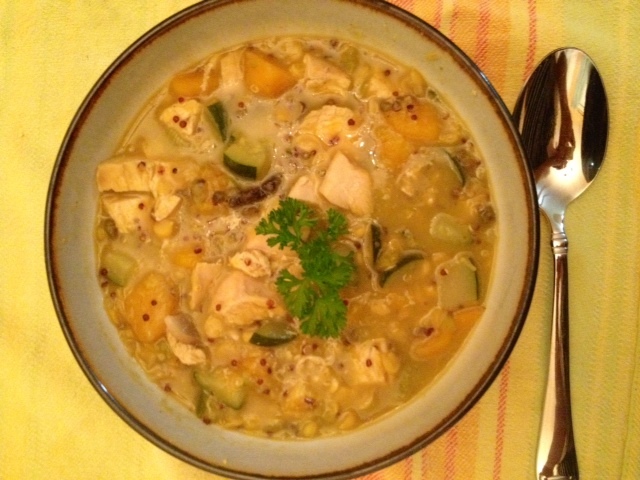 Add raw chicken, and lentils. Cook chicken for 10 minutes if raw, or 20 minutes if added frozen. Remove chicken once cooked and set aside to cool, also remove the lemon grass. When cool enough to touch, dice or shred. Continue cooking for an additional 40 minutes at a simmer. During the last 15 minutes, add in the quinoa and the chicken. Part of having a healthy body comes from having a healthy mind. After all, the mind is part of the body. Its our control center, our computer, our driver. And if it is malfunctioning, the rest of the machine can only operate successfully for a time. Once our mind shuts down, the rest will follow suit. We don’t give credit to our mind, and our thoughts much. So many people, myself included, can easily become slave to being controlled by our thoughts, rather than controlling them. We live our lives in the past, or in the dreams of the future and never experience true life -right now. I just watched a video on mindfulness. A TED talk. I love the idea of TED talks. I may not agree with what every speaker says, but its an enriching and powerful thing when people are allowed to share. This TED talk, by Andy Puddicombe is about mindfulness. He talks about taking 10 minutes everyday to meditate. I used to think that meditation was sinful. In my naive view of it, I thought it was like prayer but to a created god. I thought you had to chant or hum and sit criss cross apple sauce. But in reality, its just centering your mind back to the present. Its allowing yourself to live in the NOW. To have balance in my life, I have to have a healthy mind. I need to balance the past with the future, in the NOW. I need to have a healthy body that is lead by a healthy mind. Take 10 minutes to watch this video, and then have 10 minutes of being mindful. After you watch the video and practice mindfulness, share in the comments what you thought. So my husband has really become crazy about Kale. I bought a bundle of it a week or so ago. To be honest, I can’t even remember why I got it, but we ended up making a salad out of it. As if he took 14 shots of espresso and a multivitamin, he was ready to build a barn with his energy! Since, we’ve both become kind of crazy about Kale. Its tasty, versatile and really really good for you. Its like taking crunchy lettuce and sprinkling a vitamin on top… don’t do that though, that sounds gross. And to top things off, I’ve been hearing lots of talk about Kale Chips. Coincidence??? I think not. It is time for two wonderful things to collide on the MyBetterBalance Blog. Thankfully, there’s not much to Kale chips. They are pretty basic and can be altered if you want to get fancy. But I’ll keep it simple. 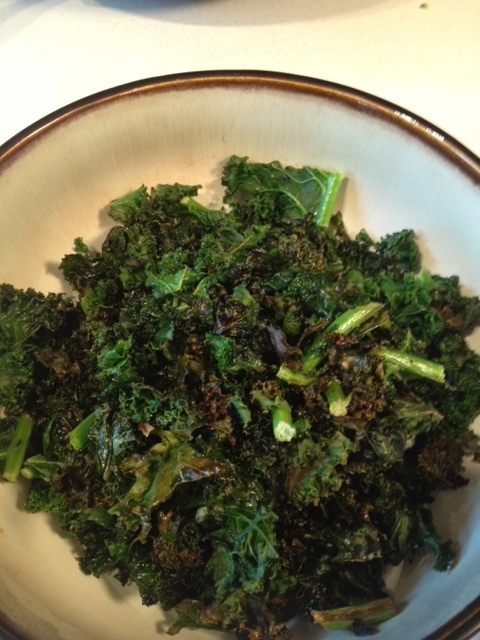 large bowl of washed Kale. If its not pre-chopped, rip the leaves off the stalk into bite-sized pieces. 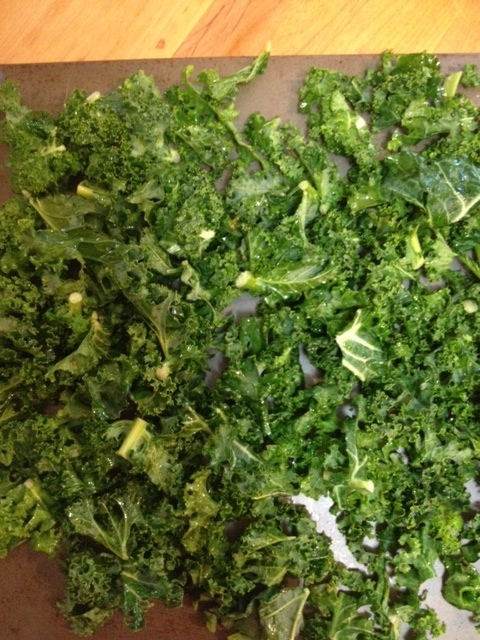 In a large bowl, hand toss the kale with 1 Tbsp of olive oil and 1 tsp of salt. Lay out on a baking sheet. Bake at 400 degrees for 15 minutes. Toss the kale about 10 minutes in. YUM!!!! Enjoy crunchy, chips that aren’t going to do a number on your waist line. I think we all wish that we can add wonderful things into our life without the cost of having to change things. I know I wish for that. But I have come to believe that rarely things come for free. Some friends of ours just announced that they are pregnant today, and we are sincerely overjoyed for them. But I couldn’t help but think as to how much their lives are going to change with a baby. Of course, the budget crunches, the home improvements, the lifestyle changes are going to be worth it to hold a brand new life in their arms. So worth it!!! How often do we look at the sacrifices we have to make in order to obtain something positive, and then get stuck on the sacrifices. Do we get stuck thinking about what something will cost, what we will have to give up, or what will change in order to obtain something we really want? Somethings are JUST WORTH IT! No matter the cost. Is it worth focusing on something that is holding you back and risking something that will totally rock your world?